Unions of zemstvos and cities. Organizations in the Russian Empire set up after the outbreak of the First World War for the purpose of assisting the Russian army with supplies and road-building in the war zone and aiding wounded soldiers and (beginning in 1915) war refugees. Until July 1915 the All-Russian Zemstvo Union (Vserossiiskii zemskii soiuz) and the All-Russian Union of Cities (Vserossiiskii soiuz gorodov) acted independently of each other. Then their work was co-ordinated by the United Committee of Unions. Each union had its head office in Moscow, which represented a network of county, gubernia, and war-front committees. In Ukraine the Union of Cities of the Southwestern Front was headed by Teodor Shteingel, and numbered among its employees Mykola Biliashivsky, Andrii Viazlov, Dmytro Doroshenko, Ivan Kraskovsky, Volodymyr M. Leontovych, Fedir Matushevsky, Andrii Nikovsky, and V. Ulianytsky. The Zemstvo Union of the Southwestern Front was headed by S. Shlykevych. 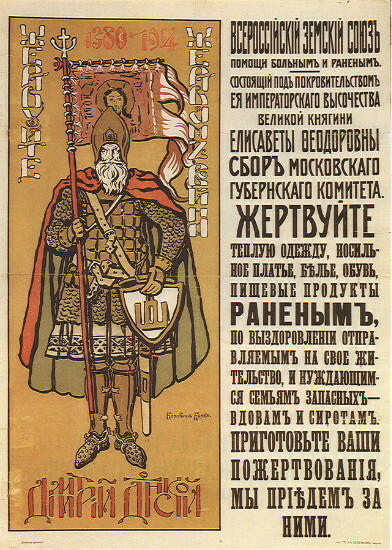 From 1916 Symon Petliura was plenipotentiary of the unions of zemstvos and cities at the western front. Subsidized by the government, the unions helped the population of Galicia and Bukovyna during the Russian occupation as well as refugees from Galicia. Ukrainian women organized a number of hospitals (even in Petrograd) for Ukrainian soldiers. Hundreds of Ukrainians worked in the unions and acquired managerial and administrative skills, which later proved useful in the setting up of a Ukrainian state. The zemstvo and city unions in Ukraine continued their work in a modified form under the Central Rada and the Hetman government (see All-Ukrainian Union of Zemstvos). Until June 1915 their main offices were in Lviv and then Kyiv.